Visiting the Amedei Tuscany booth at the NW Chocolate Festival this past weekend reminded me that I still needed to post a review of their Chuao bar that I had awhile ago. Chuao cacao is a rare form of Criollo that comes from Venezuela. 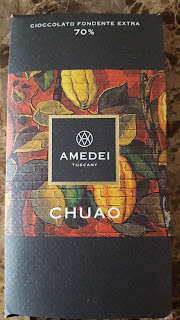 When I first starting eating Chuao bars it took me awhile to get use to them because they taste so different from the chocolate bars so many of us grew up eating. I find Chuao to often be very rich, and earthy which may take you a little time to get used to eating, so I suggest eating 2 squares, wait a few days, eat two more, etc. Keep taking notes on what you taste because I bet you’ll get more each time you try one of these bars. Enjoy! Texture; Smooth, medium bodied mouth feel, melts fairly quickly. Taste: Tobacco, cherry, coffee, oak, quality pie crust, touch of black pepper. Finish: Long finish, light acidity, tobacco, and coffee notes continue to the end. Have you tried this, or any other Chuao bars? What are your thoughts on them? Note: This review first appeared in my original Blogspot site on 11-14-16.